The US looks ready to further internationalize the Macedonian Crisis that it cooked up, seeing that its domestic agents are failing in their desperate attempt to overthrow the government. Aside from the very real possibility of violent provocations, whether by the "protesters" or cross-border Albanian terrorist groups operating in occupied Kosovo, the next step will be to retract recognition of the democratically elected and legitimate authorities immediately after or right before the 5 June election and replace it with Western support for the "opposition", not necessarily as represented by Color Revolution stooge Zoran Zaev, but by "Special Prosecutor" and institutional coup initiator Katica Janeva as a "temporary technocratic" placeholder. The purpose in doing this isn't just to spark a civil conflict inside the country and sanction all of the VMRO leaders and the rest of the Macedonia's civilian population (under two separate sets of sanctions, personal and national, respectively), but to have Janeva request "international (NATO) peacekeepers" in quelling the Hybrid War violence that she and her American allies might have fomented by that time. Practically speaking, the US might immediately respond by illegally and aggressively dispatching "KFOR" and the Albanian military into the majority Albanian-populated regions of the country, essentially occupying these parts just as they did Kosovo and leading to the partition of the country. Defense Minister Jolevski is very close with the US and would order the military not to resist the invaders, creating a split within the ranks and dividing the armed forces between passively obedient coup supporters and Macedonian patriots that would fight to defend their homeland from invasion. This process is directly related to the West's planned reversal of recognition of the Republic of Macedonia's government and its replacement of support to Janeva's illegal "technocratic" one instead. As per the internationalization of the Hybrid War crisis, the US might also display a show of force by launching a "Dragoon March" through the Balkans just as they've previously done through the Baltics and Poland, this time sending heavy weaponry from Croatia to occupied Kosovo's Camp Bondsteel via Serbia as per the recent transit privileges that Vucic's government sneakily gave to the bloc. Similarly, it can be expected that the influential revanchists in the Bulgarian establishment will be eager to coordinate with NATO in order to gain a symbolic nationalist advantage that distracts their public from the deteriorating domestic conditions in the country and increases approval of the unpopular government. 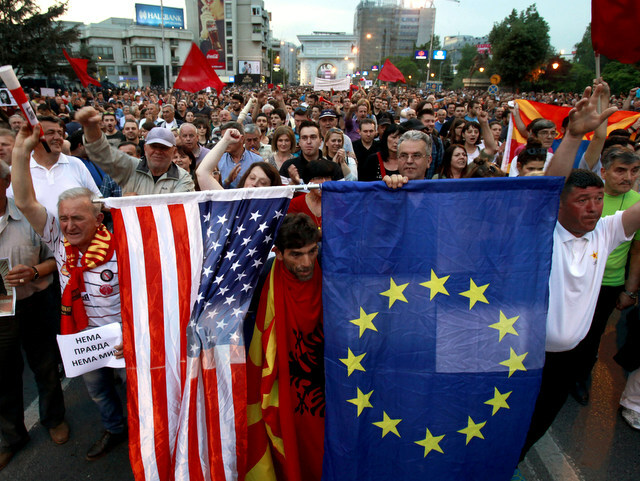 The militant internationalization of an intensified Macedonian Hybrid War Crisis to include NATO, US, Albanian, and Bulgarian "peacekeepers" (occupiers) illegally "invited" into the country would lead to the Republic of Macedonia's eventual partition, first through Janeva-Zaev's forced imposition of "federalism" and a revision of the constitutional name under "emergency" martial law conditions and secondly through the country's division into Albanian and Bulgarian "spheres of influence" and then formal annexation into Greater Albania and Greater Bulgaria. The end game is to erase Macedonia from the map, its language from the books, and its people from the global consciousness. It's post-modern cultural genocide, a more "sanitized" version of what the Turks savagely did to the Armenians over a century ago, but with the possibility of becoming just as barbaric if the situation spirals out of control, God forbid. In the face of these intimidating threats, the Macedonian people must continue to stand strong and not be deterred by the rhetoric coming out of the West. The more upset that US and EU leaders become, the more that this proves just how successful the Macedonian Resistance has been in defying the Hybrid War plotters and defending the Macedonian homeland. Calm, thought-out, and peaceful responses are key to resisting the street provocations that the regime change goons are tempting everyone to fall for. The best thing that each and every single Macedonian can do at this moment is to publicly demonstrate in support of their government and take to social media in sharing the truth about what's really going on with the rest of the world. Everyone needs to interact with as many foreigners and international media networks (whether mainstream or alternative) as possibly in spreading the word about the Macedonian Resistance and the US' Hybrid War plot against the country. By cohesively sticking together and peacefully maximizing their collective capabilities, every Macedonian can do their duty in resisting the cultural genocide and ensuring that the millennia-old Macedonian civilization survives this latest sophisticated attack against it.